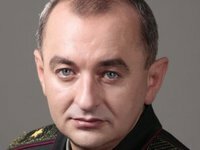 Investigators deny that the fire at ammunition depots near Balaklia in the Kharkiv region could have been sparked to conceal an ammo theft, Ukrainian Chief Military Prosecutor Anatoliy Matios has said. "I cannot give you the amount and types of armaments, yet it is practically impossible to steal, spend or intentionally retrieve property stored in those depots in any other way now that they are protected by a force of nearly 1,000 men," Matios told a press briefing in Kyiv on Thursday. Five percent of those projectiles were unserviceable and subject to scrapping under a special program, he said. "To say that this is a silly attempt to conceal some sort of abuse or loss of property is to go against normal logic," the military prosecutor said. According to Matios, the blast zone and areas dangerous for the civilian population have been identified by relevant agencies. "A map has been drawn and estimates have been made, which limit the possible threat posed by fragments of detonated artillery and tank munitions to the town of Balaklia and the villages of Borschivka, Verbivka and Yakovenkove. The population of these areas exceeds 35,000," Matios said.